Fellow anti-war protester and member of Socialist Environmental Alliance Goretti Horgan, who was one of those protesting outside the building at the Ulster Science and Technology Park on Buncrana Road, said: “There is a bit of property damage but that is as nothing compared to the thousands of people dying. The British authorities in Northern Ireland are mounting a very serious attack on the liberty and rights of anti-war protestors. Nine activists who took part in an occupation of the American arms corporation Raytheon’s offices in Derry have been charged with aggravated burglary and unlawful assembly. The bail terms imposed on them effectively remove their right to take part in political activity. Raytheon is the fifth biggest arms manufacturer in the world. It manufactured the 100 GBU-28 bunker buster bombs urgently flown by the United States to Israel at the height of the destruction of Lebanon by the Israel Defence Force. Among the many services Raytheon has performed for Israel is supplying electronic equipment for the apartheid wall being built on Palestinian land. The National Lawyers Guild of the US has accused Raytheon of being ‘implicated in the commission of war crime’. On 9 August 2006 the Derry Anti-War Coalition organized a non-violent occupation of Raytheon’s plant in the Ulster Science and Technology Park. This followed direct action that has been mounted by anti-war protestors against US military planes at Shannon airport near Dublin and Prestwick airport near Glasgow. 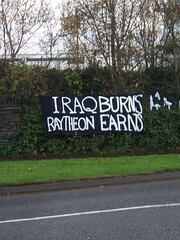 The Derry protestors decommissioned computer equipment used by Raytheon to produce software for its weapons systems. Nine of them were arrested by the police, among them Eamonn McCann, well-known as a civil rights activist and campaigning journalist. They have been charged with aggravated burglary and unlawful assembly. These are very serious offences that could mean the accused could be denied the right to trial by jury under British security legislation prevailing in the north of Ireland. The protestors’ civil liberties are further threatened by the terms under which they have been released on bail. They are forbidden to communicate with each other or with anyone working for Raytheon and may not take part in any public or private anti-war meeting. These restrictions bear comparison with those imposed by striking British miners brought before courts during the 1984-5 strike. The Raytheon Nine are facing imprisonment for staying true to the principles Hain has abandoned. Like peace campaigners elsewhere in Ireland and in the rest of the world, they took non-violent direct action. Their trial is a threat to the global anti-war movement. 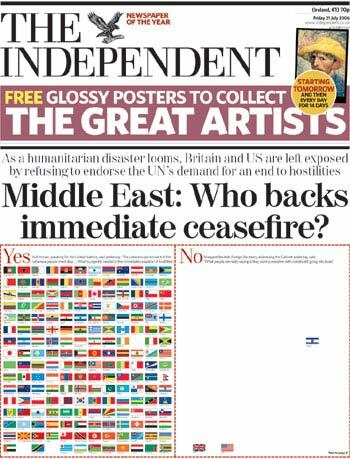 At a time when the clouds of war are darkening and spreading over the Middle East, the right to protest must be defended. We demand that all charges against the Raytheon Nine be dropped immediately. Is there any solidarity action planned at the Scottish plant in Glenrothes?